said she heard a pop too and that the other coach said that she had heard a pop. The trainer examined it and said it looked like more meniscus. She asked about my previous injury. I iced and she looked at it again. She said to come see her tomorrow. I tried calling my therapist but could not get through that night. So my coach called in the morning to get there original prognosis of what it was. They said lateral meniscus. I saw the trainer and told her. She said she thought it was medial meniscus this time but that did not explain the pop. She said to see a Dr. when I got back. She said I could play that day but that she did not recommend it! SO I watched. When I got back I saw my therapist and he said that I should see a DR. So I scheduled an appointment about a week later. When I saw him, he messed around with my knee moving it different ways. He said that because my legs were so strong he could not do the regular tests that he usually did, so he did some special ones, but he still was not sure. I got an x-ray, which didn’t show anything. So he said that he wanted me to get an MRI. I did the following day, Tuesday, (my birthday) and scheduled an appointment for the following Monday. I filled out this paper that my therapist gave me so that they would get the results too. Since soccer started on Monday we asked if they could call us with the results. 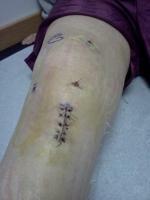 SO I had my MRI and then the next day they called and told me that I had torn my other ACL and some meniscus. They said I could come in the next day to talk. After my mom hung up with my Dr, my therapist called. He asked if we heard what happened and she told him yes. They talked a bit. She told him that I still wanted to play. He said it was possible but that I would risk further meniscus injury, but I did not want to miss another season. The next day I saw my Dr. and he told me my options. I could do nothing about it, get surgery or play with a brace. I told him that I was not quite ready for surgery again. We told him that we would get back to him. After my parents and I talked about it they decided that they would be ok with me playing. Since I still wanted to get it fixed eventually I think I will have surgery some time in January then I will still have enough time to be ready for my Senior year! So we scheduled an appointment with an orthopedic place. Practices started and since I was not re-cleared I could not do anything yet. I was a little worried about not practicing because we have cuts and I was not able to do anything. Then Wednesday I went and got fitted for my brace. They said it would take a few days but it’s been a week and one day and its still not here yet. We called and they said it could be here today so hopefully! Anyway three days ago were the cuts and I still made the team. My coach said that he knew I was a good player and that I could begin when I got my brace. So I am just waiting, and watching our 4½ hour practices and 2 a days till I can play.